북한 사람들이 ‘망령 든 늙은이’라고 부를 만한 두 노인이 자신들의 외교 경험과 기술을 한반도 위기에 교묘하게 사용하려 하고 있다. 먼저는 91세의 지미 카터로 그는 북한에 다시 가서 김정은과 평화협정에 대해 의논할 수 있는지 알아보고 싶어한다. 둘째는 93세의 헨리 키신저다. 그는 도널드 트럼프 대통령에게 건설적인 조언을 할 수 있다고 생각하고 있다. 트럼프가 유엔 연설에서 북한을 ‘완전히 파괴하겠다’고 위협하자 북한의 조선중앙통신은 트럼프를 ‘늙다리 미치광이’라고 묘사했고 그 뒤 이 표현이 무슨 뜻인지 모든 사람이 사전을 찾도록 했다. 내 사전에 ‘늙다리’(dotard)는 ‘망령이 든 사람’(senile)으로 정의되어 있는데 이 표현은 트럼프 보다는 카터와 키신저에게 더 정확한 표현이 될 것이다. 이 두 사람은 제정신인 것처럼 보이지만 북한이 마침내 정신을 차리고 핵협상에 나오도록 할 수 있는 시도들을 위험에 빠트리게 할 정책들을 제안하려 하고 있다. 카터와 키신저 중 누가 더 정신이 없는지 말하기는 어렵다. 카터는 북한을 방문해 빈약한 “동결 대 동결” 협정을 두고 협상하고 싶어한다. 그 협정에는 아마도 미국과 한국이 연례군사훈련을 중단하는 대가로 북한이 핵과 미사일 실험을 중단하겠다는 약속이 포함될지 모른다. 그는 김일성이 1994년 7월 죽기 몇 주일 전 평양 대동강 유람선에서 김정은의 할아버지인 김일성을 만나 유쾌한 대화를 통해 핵프로그램 개발을 중단시켰다고 주장하며 이번에 다시 평양에서 대화를 하면 김정은의 마음을 바꿀 수 있을 것으로 생각하고 있다. 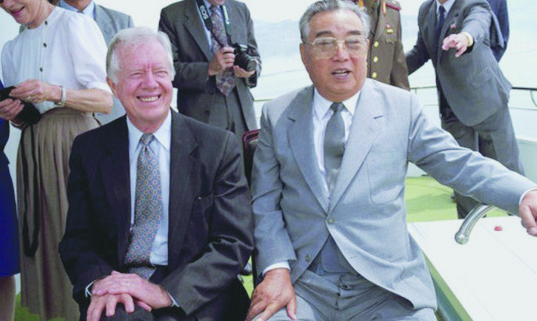 ▲ 지미카터(Jimmy Carter) 미국 전 대통령이 1994년 6월 북한을 방문하여 김일성과 함께 평양 대동강 유람선에 올라 웃고있다. 하지만 카터는 키신저와 마찬가지로 트럼프에게 아무 영향력이 없다. 키신저는 지난 11월 미국 대선 후 트럼프를 여러 차례 만났다. 자신을 항상 강력한 반공주의자라고 밝혀왔던 키신저는 베트남 전쟁 당시 리처드 닉슨 대통령의 국가안전보좌관과 국무장관을 역임하면서 최고 전성기를 누렸다. 그는 미국과 중국의 국교 수립에 막후 역할을 했고 1973년 1월 북베트남과 파리평화협정을 체결하도록 교섭해 나중에 노벨평화상을 받았다. 전임 미국 대통령으로 1970년 중국과 공식적으로 국교를 수립한 카터 역시 완전 친(親) 중국이다. 그는 트럼프에게 중국에게 너무 함부로 하지 말라고 조언해왔다. 그는 중국이 북한을 핵, 미사일 협상으로 끌고 나올 당사자로 보고 있다. 중국은 ‘동결 대 동결’ 협정을 매우 좋아한다. 그것은 한미 간 군사훈련뿐 아니라 양국의 전반적인 군사 협력까지 억누르면서 한미 동맹을 약화시킬 수 있기 때문이다. 트럼프와의 마지막 만남에서 키신저는 추가 미사일 시험발사와 추가 핵실험을 하지 않겠다는 것만 북한에 요구하는 거래라고 해도 이 ‘동결 대 동결’ 협정을 하라고 트럼프에게 제안했다. 북한이 추가 미사일 시험을 멈춘다고 그들이 미사일 생산 자체를 중단하는 것은 아니다. 분명히, 북한은 미국 본토에 도달할 수 있는 장거리 미사일에 핵탄두를 설치하는 기술 개발을 멈추지 않을 것이다. 또 이것을 검증하려고도 하지 않을 것이다. 키신저가 미국의 적들을 얼마나 잘못 상대했는지 우리는 기억해야 한다. 1973년 파리평화협정은 완전한 실패였다. 이 협정에 따라 미국은 남베트남에서 미군을 철수했고 폭격을 중단했으며 그 결과 남베트남이 북베트남에 공격당하도록 완전히 노출시켰다. 북베트남은 미국이 남베트남 군대에 추가 무기공급 지원을 중단한 후 몇 달만에 남베트남을 쉽게 장악했다. 닉슨 대통령이 워터게이트 스캔들로 대통령직에서 물러난 후 부통령에서 대통령이 된 제럴드 포드는 북베트남 공습을 승인하지 않았다. 키신저는 북베트남이 파리 평화협정을 준수했어야 했다고 영원히 주장할 것이다. 그는 자신이 받은 노벨평화상 반납을 생각했었다. 당시 북베트남 협상가였던 레둑토는 오슬로의 노벨위원회가 자신을 노벨평화상 공동수상자로 선정하려고 안달했지만 이를 거부했다. 키신저는 베트남에 대한 경험이 없었고 남베트남을 장악하려는 북베트남의 움직임을 이해하지 못했다. 그는 남베트남이 겪고 있는 어려움과 남베트남 군대와 미국 동맹들의 고충과 희생을 전혀 몰랐다. 평화협정은 인기없는 전쟁에서 미국이 발을 빼는 겉보기만 좋은 구실에 불과했다. 키신저는 한국에 대해서도 거의 경험이 없다. 그는 자신이 모든 것을 다 안다고 믿기 때문에 북한과의 협상에 대해 다 이해하고 있다고 생각할 것이 틀림없다. 트럼프와 대화한 내용을 볼 때 그는 미국과 거짓 ‘평화협정’을 체결하고 이를 북한식 통일로 이끌고 가려는 북한의 끊임없는 야망을 이해하지 못하고 있다. 키신저의 워싱턴 DC 사무실인 ‘키신저 협회’(Kissinger Associates)는 중국과 수백만 달러의 사업을 해왔다. 그는 사실상 중국 손 안에 있는 것이다. 이런 관계를 볼 때 트럼프가 그의 충고를 받는다는 것은 생각만해도 역겨운 것이다. 대신 트럼프는 짐 매티스 국방장관, 렉스 틸러슨 국무장관, 맥매스터 국가안전보좌관 등 최측근 참모들을 의지해야 한다. 그들 모두는 제2의 한국전쟁을 피하고 싶어한다. 그 누구도 오직 한국에만 재앙이 될 북핵 협정을 체결하면서 중국과 북한의 압박에 굴복하는 것을 원하지 않는다. On Guard: Kissinger and Carter, Eager to Give Trump Bad Advice on North Korea, Are Urging One-Sided "Treaty"
Two old men, whom the North Koreans might properly call "dotards" are insinuating their diplomatic knowledge and skills into the Korean crisis. First there is 91-year-old Jimmy Carter, who yearns to go yet again to North Korea and see if he can talk over a peace agreement with Kim Jong-un. And then there's Henry Kissinger, who, at 93, thinks he's capable of offering constructive advice to President Donald Trump. It was the North Koreans who had everyone reaching for the dictionary after a KCNA commentary described Trump as a "dotard" for threatening in the United Nations to "totally destroy" North Korea. My dictionary defines dotard as a "senile person" a term that would probably apply more accurately to Carter and Kissinger than to Trump. Both of these gentlemen seem to be in control of their basic senses but risk recommending policies that pose a serious danger to attempts at compelling North Korea finally to listen to reason and come to terms on its nuclear program. It would be difficult to say which one is more useless, Carter or Kissinger. Carter wants to go to North Korea and negotiate a weak "freeze-for-freeze" agreement, maybe even a peace treaty, in which North Korea would promise to stop testing nukes and missiles while the Americans and South Koreans stopped their annual war games. He evidently thinks a little happy talk in Pyongyang would warm over Kim Jong-un just as he claims to have charmed Kim's grandfather, Kim Il-sung, into stopping his nuclear program when they talked in a boat on the Daedong River in Pyongyang several weeks before the Great Leader died in July 1994. Carter, however, does not have Trump's ear as does Kissinger, who has met him a number of times since his election in November of last year. Kissinger, who has always claimed to be a staunch anticommunist, reached the pinnacle of his career as national security adviser and then secretary of state for President Richard Nixon during the Vietnam War. He is best remembered for having engineered the opening of U.S. relations with China and then for negotiating the Paris peace agreement in January 1973 with North Vietnam, for which he received the Nobel peace prize. Like Carter, who was president when the U.S. formally opened ties with China in 1979, Kissinger is totally pro-China. He has advised Trump not to be critical of China, which he sees as the main player in bringing North Korea to terms on its nukes and missiles. China loves the idea of freeze-for-freeze, which would weaken the U.S. alliance with South Korea by stifling not only military exercises but overall cooperation between the armed forces of both countries. Kissinger, in his last meeting with Trump, recommended that Trump go along with freeze-for-freeze even though the deal would only require North Korea not to test-fire more missiles or detonate another nuclear warhead. There would be no stopping the North Koreans from producing more missiles even if they suspended missile tests. Certainly, North Korea would not cease research and development of the means for attaching warheads to the tips of long-range missiles capable of reaching the continental United States. Obviously, there would be no "verification" of anything. One should remember that Kissinger has been thoroughly misled on deals with enemies of the U.S. The Paris peace agreement of 1973 was a formula for failure under which the U.S. withdrew its last troops from South Vietnam, ceased bombing and basically exposed the South to invasion by the North Vietnamese. They easily overran the South in the first few months of 1975 after the U.S. Congress refused to authorize more weapons shipments to South Vietnamese forces. Gerald Ford, who had risen from vice resident to president after Nixon resigned in the Watergate scandal, would not authorize air strikes. Kissinger would claim forever that North Vietnam had gone back on the Paris peace. He thought of retuning his Nobel, which Le Duc Tho, the North Vietnamese negotiator, had already rejected when the Nobel committee in Oslo had the crazy idea of making them co-winners. Kissinger had no experience in Vietnam, did not understand the dynamics of the North Vietnamese drive to take over the South, had no concept of the suffering the South Vietnamese would endure and did not appreciate the hardships and sacrifices of South Vietnamese troops and their American ally and benefactor. The Paris peace was merely an elaborate cover for American withdrawal from an unpopular war. Nor does Kissinger have much experience in Korea. Since he believes he understands just about everything, he undoubtedly is convinced he has a firm grasp on the realities of dealing with North Korea. If his conversation with Trump is any guide, however, he seems unaware of North Korea's unremitting ambition not just to reach a phony "peace treaty" with the U.S. but to use any agreement as a stepping stone to reunification on North Korean terms. Kissinger's Washington DC firm, Kissinger Associates, has done multi-million-dollar business with China. He is in effect in China's pocket. It is disturbing, considering that relationship, to think that Trump should listen to his advice. Rather, Trump should go on counting on those in his immediate entourage, including Defense Secretary Jim Mattis, Secretary of State Rex Tillerson, and National Security Adviser H,R. McMaster. All want to avoid a second Korean war. None wants to yield to Chinese and North Korean pressure for a deal that would only risk disaster for South Korea.